I am astonished when I think back on all of the straining (in the form of labne) that I have made over the years, only to note that I haven’t used cheesecloth in the process. I used cheesecloth to strain my stocks when I lived in San Francisco and didn’t have a good chinois, or conical strainer, but that’s about it. My cloth of choice, and my mother’s cloth of choice (and her mother’s and that of Sittos throughout history, no doubt) was always a husband’s (or in my case, a father’s) handkerchief for the same purpose: the fine straining of liquids from solids. Gauzy cheesecloth has won me over recently in the making of Lebanese cheese, though, and not just because our men don’t carry handkerchiefs much these days. I’m attracted to the gauzy, ethereal feel of cheesecloth, but also its disposability and of course, effectiveness. Rinsing then washing out a handkerchief is alright, but an extra and often messy step. The cheesecloth also, and primarily, gets the job done right, leaving behind all of the curds and allowing the whey to drain off swiftly. 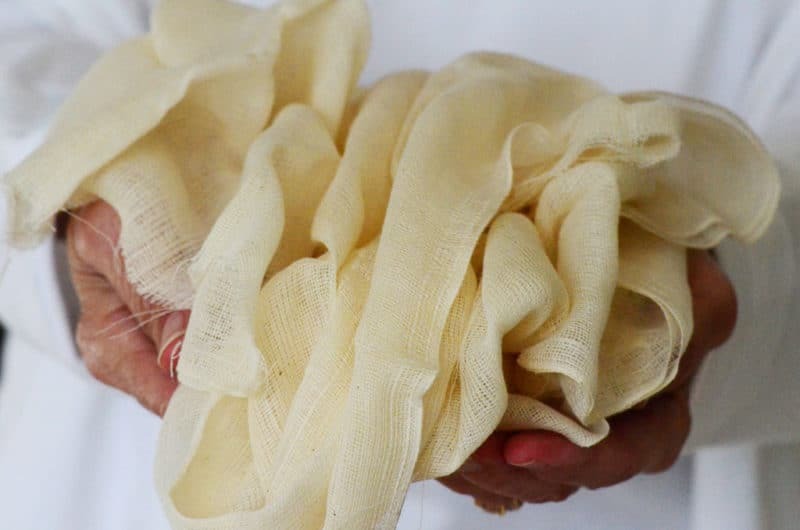 Cheesecloth comes in many gauges, from open to tight weave, but it seems to me I’ve encountered only one type of cheesecloth, not multiple options, available in its little packet in the grocery or at a craft or kitchen shop. What I found recently is great, ultra-fine cloth; you can get any gauge if you order online, but often we need it right-this-minute-now, and take what we can get. If the cloth you find is too open for your straining work, it can be doubled or tripled over so that the liquid comes through very clear. In the case of our Lebanese cheese, the liquid or whey is strained off of the curds, and this is beautifully handled bundled in cheesecloth in the sink. 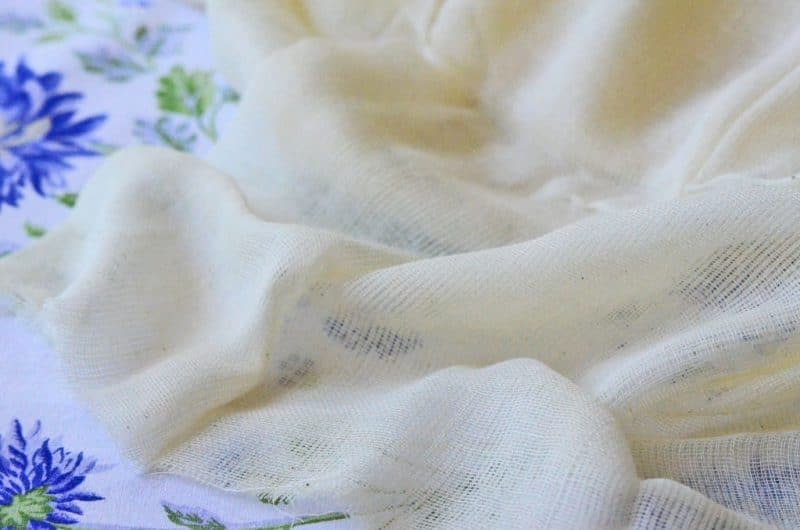 I just might start employing my cheesecloth to drain my weekly labne, and anything else I can think of to give me an excuse to pull out a little ultra-fine softness to get the job done. 5 Responses to "Favorite Things: Cheesecloth, ultra-fine"
Memories, memories—-I can see my Mother pouring the luban into her worn-out, old, white (they were all white in those days) pillowcase, tying it up to the kitchen faucet for its overnight magical transformation, and then being eagerly devoured the next morning by her always appreciative family. Then the pillowcase would be washed, sunshine dried on the clothes line (the only clothes dryer we ever had), folded neatly, and returned to its reserved space in the bottom drawer in the kitchen. Although I have only made it once (since I can now buy it commercially made at my local, village market), I too have my white pillowcase (new-bought for the job) folded neatly in my bottom kitchen drawer. (Oh, the lovely and loving weight of tradition). Thank you, Dear Maureen. Yep, me too, remember my Sito using a “dish cloth” which was just a plain sheet of cloth that was normally used to dry dishes. About 2.5 by 2.5 feet with the edges sewed such that it wouldn’t ravel. She hung the loaded cloth above the stove, draining it into a pot. Don’t remember what she hung it from but can see her happy smile even today. I always thought she was happy when cooking, I later realized that anytime her first born grandson was visiting her she was happy. I hope you aren’t throwing away that whey! It makes wonderful bread–I make yogurt, then drain it in a “yogurt cheese” strainer and save the whey for bread-baking. Dad always used a pillow case and hung it on the cloths line. Never thought about the liquid or the fact that it was in the sunshine rather than a cool place. Guess it didn’t kill us. I remember my Mom using a pillow case, and hanging it from the bathtub faucet. Thanks for the memories.